In June, I shared the evolution of our dining room and talked about some changes I wanted to make. I've finally painted and moved some furniture around and progress is being made! 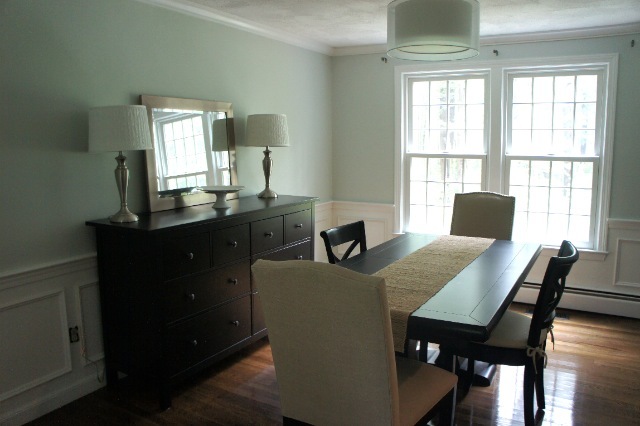 I changed the wall color from Benjamin Moore Stone to Benjamin Moore Healing Aloe. 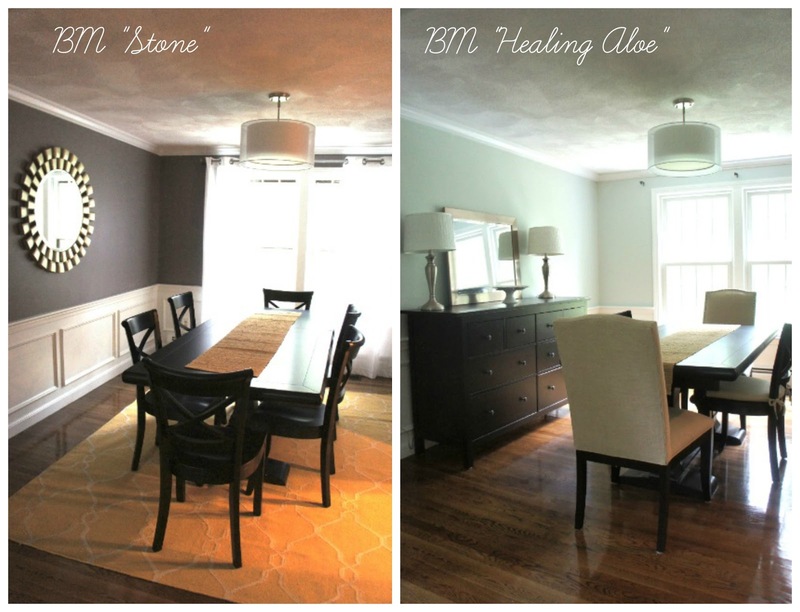 While I loved Stone the room now feels so much lighter and brighter! Jake and I also lugged the large black Ikea Hemnes dresser downstairs. It's the perfect depth and I'm excited to start filling those drawers with table linens, silverware, and other kitchen stuff. I had these two Target lamps and this Target mirror kicking around so I placed them here for now. I love the shape of the lamps, but I'm not sold on the finish. I may spray paint the lamp bases and do something with the shades. Using this mirror will save some serious mulah because the Pottery Barn Eagan Multipanel Mirror I was eyeing costs $700! ... I ordered the Holman Entertaining Shelves in black to hang above it. I also ordered the Celeste Damask Curtains (fingers crossed they match ok with the paint color!) and the Color-Bound Seagrass Rug In Natural which is back-ordered until September (wahh). Slowly but surely it's coming together! I am sticking to my promise to finish this room before I move on to anything else. Happy Weekend! I love your bar cart! It looks awesome, now I want one. Target baby. 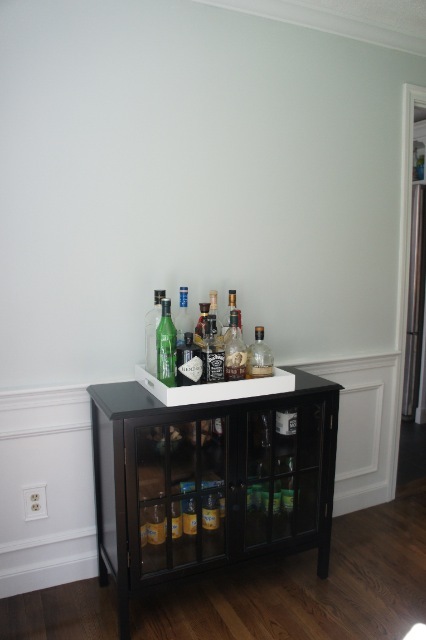 I don't think bar cart was the original intention of this piece, but it works well! Love the look of the room! Those shelves will look great over the bar cart! Can't wait to see! Thanks, Ashley. Me too! They get here tomorrow. Yay! I love those bar shelves! The room is going to look so pretty once you get everything in there.